This new work by Adriane Strampp continues to explore the remembered landscape; fragmented views of journeys made reflecting Strampp’s own peripatetic upbringing and sense of dislocation. It reflects upon the passage of time, absence, memory and loss, portrayed in largely monochromatic, improbable colour. The work posits our own tendency to colour our memories and reflections. As Strampp describes a sense of transience and motion when there is no final destination, we are taken along for the ride, fleeting glimpses of the passing landscape that give us non-specific views that nevertheless involve a sense of familiarity. It is the movement, the lack of connection that concerns her, rather than the traditional art historical landscape. Occasional reflections are placed across works such as Rise 2015, deliberate visual barriers, so separating the viewer from the landscape, transforming them instead into an objective observer. As with her earlier work, subtle visual barriers at odds with the image are frequently employed as a means of creating uncertainty and unrest. 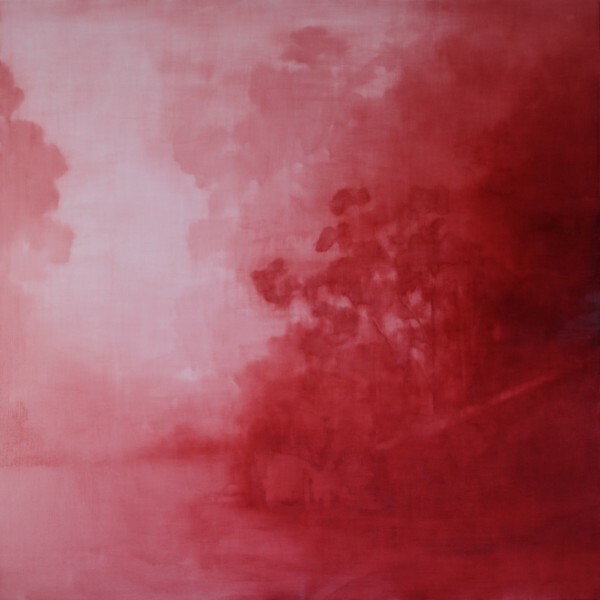 Strampp’s surface is a time-consuming construction involving the use of wax and delicate colour washes that depict the hazy, ephemeral and elusive nature of memory. As paint is allowed to run and dissolve there is a melancholic sense of transience and at the same time, in keeping with the notion of fleeting memory, other areas are painted in detail. The strong hues are used for their capacity to elicit emotional responses, as well as to capture the subjective nature of memory.